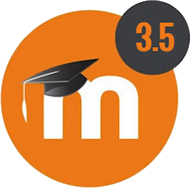 Faculty: What's New in 3.5: Welcome to Moodle 3.5! We skipped right over 3.4 and upgraded to Moodle 3.5 on September 5. Jump to... Jump to... Respondus 4.0 Web Services Faculty: Request Moodle Archive Retrieval Students: What's New in 3.5 Student Guide to Moodle Two Minute Moodle for Students (CC) Missing Classes?